MEMPHIS, Tenn. - DeAndre Kane scored 22 points and D.D. 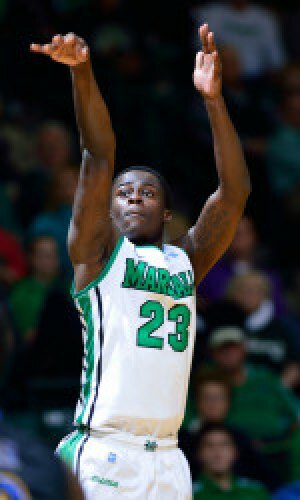 Scarver scored 20, but the Marshall men's basketball team came up two points short of a victory in a 73-72 loss at Memphis on Saturday in front of 16,386 at FedEx Forum. Although the Thundering Herd (9-11, 2-3 C-USA) never held a lead, it had two possessions in the final minute of the game with a chance to go on top. Marshall trailed 71-69 and had possession with 1:03 to play, but the Herd missed three shots. After being fouled, Geron Johnson of Memphis (16-3, 5-0 C-USA) missed two free throws which gave Marshall another opportunity for its first lead of the game. With five seconds left, Marshall's Elijah Pittman attempted a three-pointer which fell short. After two Memphis free throws all but sealed the win, a four-point lead with two seconds to play, Kane drained a three-pointer at the buzzer for a final score of 73-72. "I'm proud of our kids, tremendous fight today against a very good Memphis club in this environment; we just battled our brains out," said head coach Tom Herrion. "We came in here with every expectation to win, and we're disappointed with the loss, but I'm proud of my kids." Scarver reached the 20 point mark for the fourth time this season. He was 7-of-15 from the field and 3-of-7 from three-point range. Scarver also tied a season-high with five rebounds which helped the Herd outrebound the Tigers 39-33. Marshall had 17 offensive rebounds which led it to 20 second chance points. "We played really well, outrebounded them by six and only had 13 turnovers on the road," Herrion said. "I'm very, very proud of my group. In a loss, which we don't accept, I think we showed today about our character coming back." A Robert Goff jump shot with 11:25 to play in the first half made it 20-18 in favor of the Tigers. Memphis then scored eight unanswered points to extend its lead to 28-18. It was then Marshall's turn for a run, as it scored seven unanswered points to get within three points, 28-25 with 6:06 to play. After a tough layup made by Scarver, the game was tied 31-31 with just over four minutes to play in the half. However, Marshall went 1-for-6 from the field the remainder of the half and trailed 38-33 at the break. Memphis, which entered the game averaging just 4.7 made three's per game, made five of its first six from three-point range, finished the first half 5-of-7 and was 7-of-16 for the game. A three from Scarver brought the Herd to within two points, 49-47 with 12:41 to play in the game. Marshall remained close throughout the half, never trailing by more than nine points. With the Herd trailing by four, Scarver drained his third three of the game to make the score 68-67 in favor of Memphis with 2:18 to play. The Herd's deficit remained one-point, 70-69 with 1:18 remaining. "I thought we played nose-to-nose, punch-for-punch with one of the best teams in America today," Herrion said. "Now our challenge is to do that night-in and night-out through our games left in the conference." Marshall shot 41.5 percent from the field, but allowed the Tigers to shoot 48.0 percent. Memphis was led in scoring by Joe Jackson who was 6-of-9 from the field and finished with 16 points. Adonis Thomas had 15 and Shaq Goodwin scored 11. Junior forward Dennis Tinnon was one point and one rebound shy of his sixth double-double of the season as he finished with nine points and nine rebounds. Goff finished with six points and seven rebounds before fouling out late in the second half. Marshall will return home for two games next week. The first is a game with SMU on Wednesday at 7 p.m. The Herd will then host UCF on Saturday at 2 p.m.